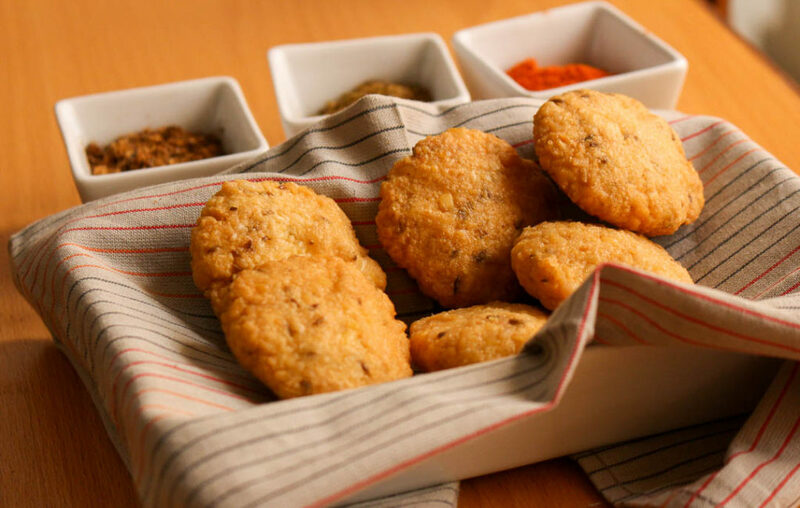 Mash ki daal kay dahi baray or dahi bhallay are delicious lentil fritters made from white lentils, which is ground into a paste. The baray/fritters are added in yoghurt, seasoned with salt and spices and topped with a sweet and tangy tamarind chutney. 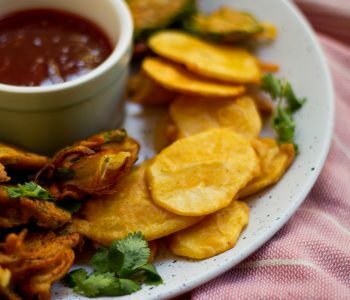 These are a popular snack or side in Pakistan, and are especially popular during Ramadan for Iftar. My favourite item from the iftar table is mash ki daal kay dahi baray (also known as dahi bhallay or lentil fritters). In our house we would usually keep the baray / bhallay (fritters) and dahi (yoghurt) separately with condiments on the side. 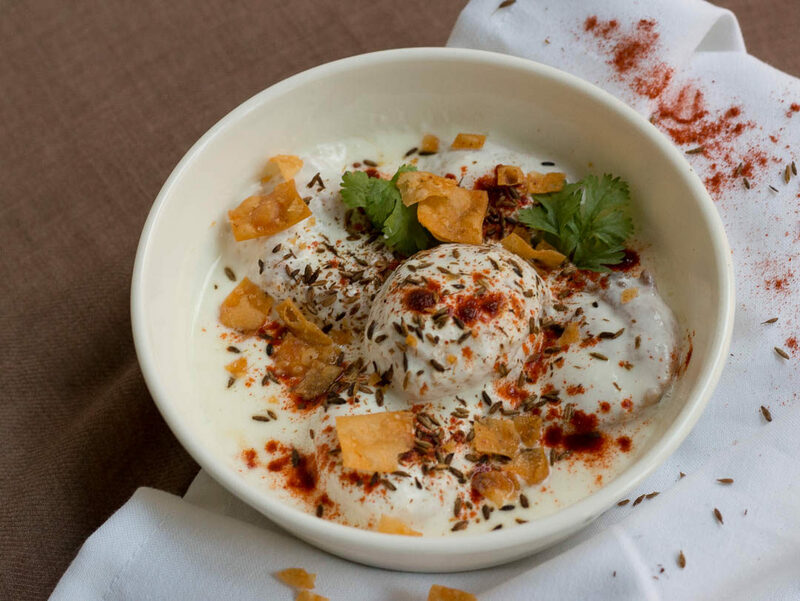 People would pick the number of baray / bhallay (fritters) they wanted to eat, add dahi / yoghurt (always salty, never sweet), and sprinkle bhuna zeera (roasted cumin), chili powder and salt on top. A drizzle of imli chutney (tamarind chutney) with papri (crisps) and that is it. In addition to the dahi baray / dahi bhallay (lentil fritters in yoghurt) we would have 1-2 items like sufaid chole (chickpeas), kalay chanay (Tyson peas), boiled potatoes or lobia (black eyed peas) on the table. Sometimes we would eat the baray / bhallay (fritters) on their own, and sometimes we would add these items making a custom chana chaat. 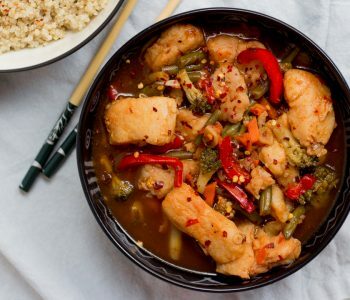 A delicious and comforting hearty iftar meal. Fried dahi baray or lentil fritters. These can be frozen and stored to use later. 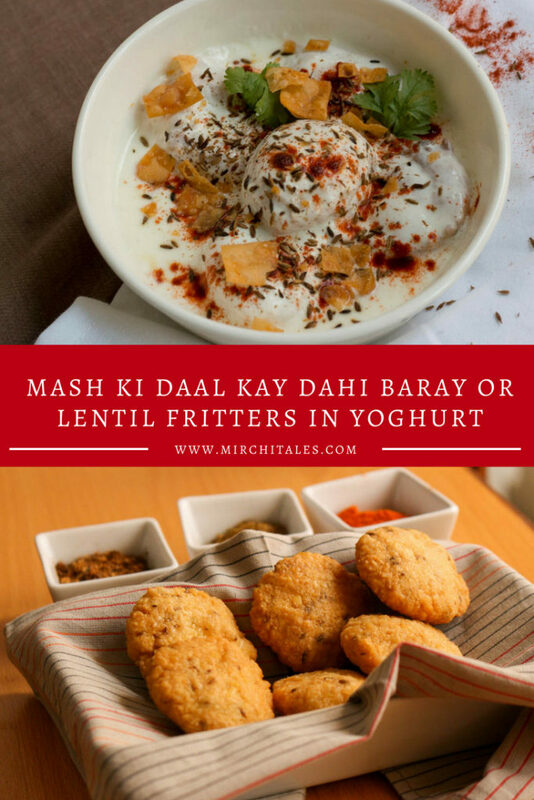 Mash ki daal kay dahi baray or dahi bhallay taste best when made with just mash ki daal (white lentils), but mash ki daal can be difficult to blitz in a blender and even in a food processor, even after soaking. This can result in a coarse texture, and heating up of the machine. If this is happening with your food processor, then it’s best to use a combination of mash ki daal with moong / mung daal (yellow lentils). This can be in a 1:1 ratio (1/2 cup mash daal and ½ cup moong daal), or in a 1:3 ratio (1/4 cup moong daal and ¾ cup mash daal). Similarly, if you don’t have a food processor and wish to use a blender, a ratio of both daal works best with enough water to make a thick paste. Note: Mash ki daal is also known as white lentils or split black lentils in English and urad daal in Hindi. Similarly, moong ki daal is known as mung daal or split and dehusked mung beans or yellow lentils. Clean and wash the mash daal. Soak for at least 4 – 6 hours or overnight. Drain the water and place daal in a food processor. Add salt and cumin seeds. Add water little by little, and process till a smooth yet thick paste has formed. Be careful that the machine does not overheat (read note regarding the same). Place the ground daal paste, add baking soda (if using) and mix. Heat oil in a karahi or a large frying pan on medium heat. I prefer to use a frying pan as it is far more stable and gives me more surface area. Use a spoon to drop spoonfuls of the batter in the oil, and cook till golden brown on all sides. 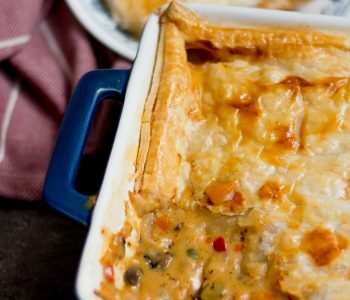 The oil should be on low-medium temperature so that the batter can crisp up from the outside, and cook through on the inside. If the batter is too thin, that maybe a case of adding too much baking soda or water. In that case, add a bit of besan (chickpea flour) to adjust the consistency. Remove the fried baray from the oil, and let drain on a kitchen towel or strainer. The baray can be cooled, put in a ziploc bag and kept in the freezer at this stage. Take a large bowl and fill it with room temperature water along with a few pinches of asafoetida / hing (optional). Put the fried baray in the water and let them soak (45 - 90 minutes) till they become soft and fluffed up. Fresh barays’ will fluff up faster than frozen ones, and they will also fluff up faster in hot water versus room temperature. If running short on time, the baray can be added in hot water but they may become too soft, so keep an eye on them and adjust accordingly. Remove the baray / fritters from the water one by one, gently squeezing them between your palms to remove the excess water. Place the baray in a plate or platter if serving them separately, otherwise add them in the prepared yoghurt mixture. Add the yoghurt, milk and salt in a bowl or rectangle dish. Whisk till smooth, and add more milk / water as per personal preference. The mixture should not be too thick, and it should not be too thin. If a sweet yoghurt mixture is preferred, reduce the amount of spices and add sugar. The yoghurt can be served separately from the baray so people can add spices and chutney as per their personal preference. 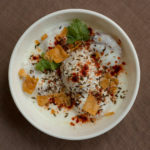 If serving together, add roasted cumin seeds, red chili powder and the baray in the yoghurt mixture. Stir together carefully, and let sit for about 10 minutes. Garnish with more spices, tamarind chutney and papri on top, just before serving. If it is hard to blitz the mash ki daal / white lentils in the food processor, a combination of mash ki daal with moong / mung daal (yellow lentils) can be used. This can be in a 1:1 ratio (1/2 cup mash daal and ½ cup moong daal), or in a 1:3 ratio (1/4 cup moong daal and ¾ cup mash daal). If you don’t have a food processor and wish to use a blender, a ratio of both daal works best with enough water to make a thick paste. I even love fried maash ki daal k baray only. Ammi has to keep me off from chugging into them while she makes these dahi bhallay.